ww2dbaseThe Akagi was designed as a battlecruiser, much like her American Lexington-class contemporaries. She was converted into an aircraft carrier under the auspices of the 1922 Washington Naval Treaty at a hefty price tag of 53 million Yen (USD$36 million). Based on a battlecruiser, Akagi was a unique looking aircraft carrier. 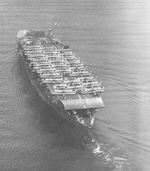 At the time of her construction, there were not many air craft carriers in the navies around the world, hence there were no "standard design" at this early stage, which resulted in her unique configuration: triple-flight deck, unconventional port-side island, and six 8-in guns. Already being the most expensive ship in the Japanese fleet, she underwent an expensive refitting in 1935 that gave her the full-length flight deck configuration that she would enter the Pacific War with. The American pilots identified her as a carrier with a boxy superstructure and an improbably high flight deck that towered six-stories above the main deck. The dive bombers attacked my ship while we were still taking evasive action from the torpedo bombers. We were unable to avoid the dive bombers because we were so occupied in avoiding the torpedo attacks.... We only received two hits.... Akagi was sunk by torpedoes from a Japanese destroyer early next morning because, as a result of the two hits, the whole ship was on fire. ww2dbaseAkagi took two bomb hits at 1026, tearing into below decks. The most damaging hit on Akagi came in the form of a near miss by Ensign Frederick Thomas Weber, which jammed the ship's port rudder, rendering her essentially unnavigable. Initially refusing to leave the ship, Admiral Chuichi Nagumo, in operational command, was finally convinced by Captain Taijiro Aoki to transfer his flag to another ship after explaining to the admiral that commanding a fleet would be impossible on a burning ship without working radio; they transferred to the light cruiser Nagara. Her engine somehow came back to life at 1203, but it was somewhat useless as she could only sail in circles to starboard due to rudder damage. At 1338, the Emperor's portrait was removed in preparation for abandoning ship, which commenced at 1350. Her hull remained afloat until 0200 the next morning when she was scuttled by two or three torpedoes from one or more of the Destroyer Division Four ships, Arashi, Nowaki, Hagikaze, and Maikaze; Akagi was the first Japanese capital ship in WW2 to be scuttled by her own fellow ships in the Pacific. As she went down, survivors aboard destroyers "Banzai! Akagi banzai!" from the safety of the destroyers. ww2dbaseAkagi was supposed to have a sister ship, Amagi. The Amagi project was abandoned after her under-construction hull was damaged beyond repair during the Great Kanto Earthquake of 1923.
ww2dbaseSources: Imperial Japanese Navy Page, Midway Dauntless Victory, the Pacific Campaign, Shattered Sword. 25 Mar 1927 Akagi was commissioned into service. 10 Dec 1928 Captain Isoroku Yamamoto, future head of the Combined Fleet, became the new commanding officer of carrier Akagi. 1 Nov 1929 Captain Isoroku Yamamoto was relieved as the commanding officer of Akagi; the successor was unknown. 31 Aug 1938 Akagi completed her modernization, emerging with the three flight decks removed. In their place was one single flight deck running nearly the length of the ship. Aircraft capacity was increased from 61 to 91. 5 Sep 1940 Akagi departed Yokosuka, Japan. 18 Sep 1940 Akagi departed Kure, Japan. 15 Nov 1940 Akagi was assigned as special duty ship in Yokosuka Naval District, Japan. 25 Mar 1941 Captain Kiichi Hasegawa was assigned the commanding officer of Akagi. 10 Apr 1941 Akagi became the flagship of the newly organized First Air Fleet and assigned to Carrier Division 1. She spent the next few weeks in and around Yokosuka, Japan and off Kyushu. 9 Nov 1941 Akagi arrived at Sasebo, Japan. 22 Nov 1941 Akagi arrived at Hitokappu Bay at Etorofu Island, Kuriles Islands as part of the assembling Mobile Force. 26 Nov 1941 Akagi, flagship of Vice Admiral Chuichi Nagumo's First Air Fleet, departed Hitokappu Bay in the Kurile Islands leading the Carrier Striking Force ("Kido Butai") in the "Hawaii Operation", the surprise attack on the US Pacific Fleet at Pearl Harbor. 7 Dec 1941 Two strike waves were launched against Pearl Harbor on the island of Oahu, Hawaii. Akagi's torpedo planes were instrumental in sinking the battleships USS Oklahoma and West Virginia. Vice Admiral Nagumo ordered a withdrawal following recovery of the second attack wave. 23 Dec 1941 Akagi returned to Hashirajima, Japan. 25 Dec 1941 Akagi arrived at Kure, Japan. 5 Jan 1942 Akagi departed with the Carrier Striking Force (Carrier Divisions 1 and 5) from Hashirajima for Iwakuni, Japan. 8 Jan 1942 Akagi departed Iwakuni, Japan for Truk, Caroline Islands. 14 Jan 1942 Akagi arrived at Truk, Caroline Islands. 17 Jan 1942 Akagi departed Truk, Caroline Islands. 20 Jan 1942 Akagi's aircraft carried out strikes against Rabaul, New Britain. 21 Jan 1942 Akagi's aircraft carried out strikes against Kavieng, New Ireland. 22 Jan 1942 Akagi's aircraft carried out strikes against Rabaul, New Britain. 27 Jan 1942 Akagi returned to Truk, Caroline Islands. 1 Feb 1942 Akagi departed Truk, Caroline Islands in an attempt to catch the enemy carrier force that attacked the Marshall Islands. 8 Feb 1942 Akagi arrived at the Palau Islands, having abandoned the pursuit of the American fleet. 15 Feb 1942 Akagi departed Palau with Kaga, Carrier Division 2, and Cruiser Division 8, screened by Destroyer Squadron 1 for the attacks on Davao and Port Darwin, Australia. 19 Feb 1942 Akagi's aircraft participated in the raid on Port Darwin, Australia and saw 9 ships damaged and 18 aircraft destroyed. 21 Feb 1942 Akagi arrived at Staring Bay, Celebes, Dutch East Indies. 25 Feb 1942 Akagi departed Staring Bay, Celebes, Dutch East Indies with the Striking Force to cover the invasion of Java. 9 Mar 1942 Akagi returned to Staring Bay, Celebes, Dutch East Indies after the fall of Java. 26 Mar 1942 Akagi departed Staring Bay, Celebes, Dutch East Indies with the Striking Force (less Kaga) together with Battleship Division 3, Cruiser Division 8, and Destroyer Squadron 1 for "Operation C", the raid into the Indian Ocean. 5 Apr 1942 Commander Mitsuo Fuchida of Akagi commanded a 125-aircraft raid against Colombo, Ceylon. Akagi's aircraft helped in the sinking of HMS Cornwall and HMS Dorsetshire. 9 Apr 1942 Akagi launched air strikes against Trincomalee, Ceylon from the Indian Ocean. 22 Apr 1942 Akagi arrived at Yokosuka, Japan. 25 Apr 1942 Captain Taijiro Aoki relieved Captain Hasegawa as the commanding officer of carrier Akagi. 27 May 1942 Akagi departed Hashirajima, Japan at 0600 hours for Battle of Midway as flagship of Vice Admiral Nagumo's Carrier Striking Force (Carrier Divisions 1 and 2). 4 Jun 1942 Akagi launched strikes against Midway Atoll. She was subsequently attacked by numerous enemy land and carrier-based aircraft. At 1026 hours, she was attacked by three aircraft from USS Enterprise, suffering one direct hit amidships in the vicinity of the island, starting a fire in the hangars. A second hit ripped through the fantail and exploded under the port quarter. The third bomb released at her was a near-miss port-side forward. Although normally the damage would had been moderate, the vessel was currently engaged in preparing a strike, with the result that the single bomb hit induced explosions among armed and fueled aircraft within hangars and start a raging aviation gasoline fire. Since she was in a maximum turn at the time, Akagi's rudder was damaged, and soon jammed at 20 degrees to port, leaving her going in wide circles. Unable to command the fleet from her now, at 1046 hours Vice Admiral Chuichi Nagumo transferred flag first to Nowaki, then to Nagara. Akagi's engines worked erratically, with the ship starting and stopping, but she went dead in the water for good at 1350 hours. By 1600 all non-essential personnel had left the ship, though Captain Aoki and a damage control party remained aboard. The vessel burned through the evening and next night, but remained afloat. 5 Jun 1942 Akagi was scuttled by direct order of Combined Fleet chief Admiral Isoroku Yamamoto. At 0520 hours, she sank bow first after two or three torpedo hits out of four fired into her starboard side by Arashio, Hagikaze, Maikaze and Nowaki. She sank in position 30-30 N, 178-40 W. More than 1,070 survivors were rescued, including her skipper Taijiro Aoki, who had replaced Hasegawa in the spring, though he had to be ordered off the ship. Only 263 petty officers and men were lost. Survivors were subsequently transferred from destroyers to Mutsu, one of the battleships in Yamamoto's Main Body. Akagi became the first Japanese capital ship to be scuttled by own ships in the Pacific War. 25 Sep 1942 Akagi was removed from the Japanese Navy List. is the akagi a plane,boat,or submarine? Keep up the great work ,I am an avid fan of IJN vessels & part of the Malaysian Plastic model building society called scalemodelsmalaysia. i am building a 1/72 scale model of akagi it is aprox 4 meters long i also have 1/450 kit not yet built i would any information that anybody has.regards bigjon. I can find no sources supporting Yamato as the Japanese flagship at Midway, all sources agree that Akagi was the flagship. Nagumo was in overall command and he was aboard Akagi (the very definition of a flagship). Yamamato was in overall command, the operation was his baby. He was aboard the Yamato. After James Brown (above) revived this topic, I must walk back by comment of 7 May 2014 that Nagumo was in overall command at Midway aboard Akagi. I had always understood that Yamamoto was the fleet commander aboard his flagship Yamato, which is correct, but I had mistakenly understood that he and Yamato remained in Japan while Nagumo sailed to Midway, which is not correct. Yamamoto and Yamato indeed sailed with the First Fleet, Main Body which stayed 600 miles behind the carrier force commanded by Nagumo. As such, as others have stated all along, Yamamoto aboard Yamato was in overall command of the Japanese forces at Midway while Nagumo aboard Akagi was in tactical command of the carrier force.